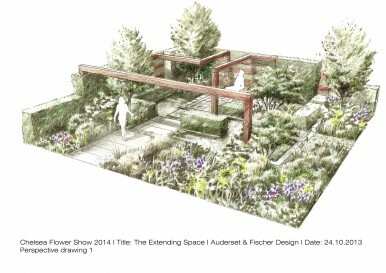 We are very excited that this time next week we will be starting construction on the Auderset Fischer Design show garden ‘The Extending Space’ on the main avenue at RHS Chelsea Flower show. The Extending Space garden has been inspired by the variety of landscapes found within the protected Pfyn Forest National Park in the Swiss Valais region, which is not only one of Europe’s last remaining large pine forests but also home to one of the most significant and diverse meadowlands in Switzerland. Climate change has seen a decline in pine trees in this region. The garden explores the spatial experience found in the forest edge, where views are framed and enveloped by trees and shrubs that recede to offer glimpses of distant wildflower meadows and the river and lake beyond. The hard landscaping is used to heighten the spatial experience, with a striking pine pergola forming the focal point. We will keep you updated with construction progress via Twitter and Facebook.